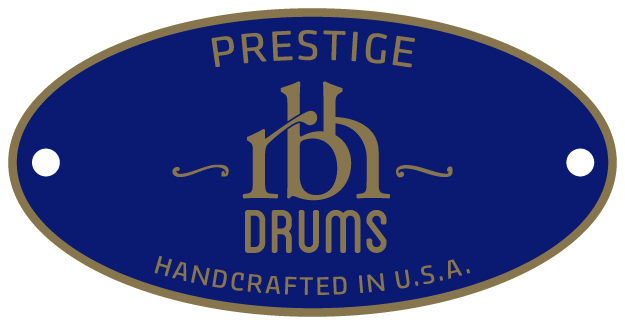 Prestige snare drums are solid shell, steam bent instruments totally hand crafted from select North American lumber. Each shell starts as a single piece of lumber that is milled to size, steamed and shaped to produce a one-of-a-kind instrument. Every aspect of building rbh drums is completed by one craftsman; from start to finish. The interiors receive as much attention as the exterior and no drum is signed until it is ready to be played. The beauty of an rbh solid shell Prestige snare drum is, no two drums will ever sound the same, even when made with the same species of lumber. Prestige Snare drums are available in Ash, Cherry, Maple and Walnut. Figured maple is available for additional charge. The poplar Prestige is hand crafted from select grade North American Poplar. Poplar is a little less dense than other hardwoods used in instrument making, but is a formidable lumber nonetheless. Poplar has been used for centuries for fine interior trim, case goods and actually piano interiors. The sound characteristics poplar lends to a drum is simply fat and sweet. Poplar makes a beautiful sounding drum. Poplar Prestige snare drums are built using the same methods as the Prestige. Each Poplar Prestige uses cherry reinforcing hoops, for both visual and sonic qualities. 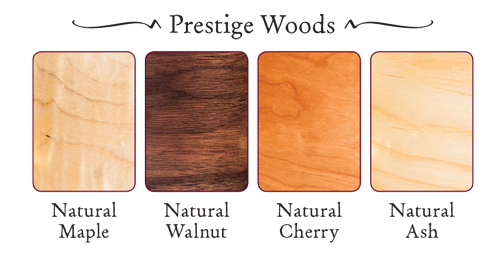 Prestige Poplar can be provided with either a natural finish, decorative wood inlays, or covered with an exotic veneer. Bearing edges for all drums can be 45 degree, rounded edges, or a combination.